Students from St Mary’s College in Derry and Loughborough Schools Foundation have been awarded the GSK Young Engineer and Young Scientist of the Year titles. 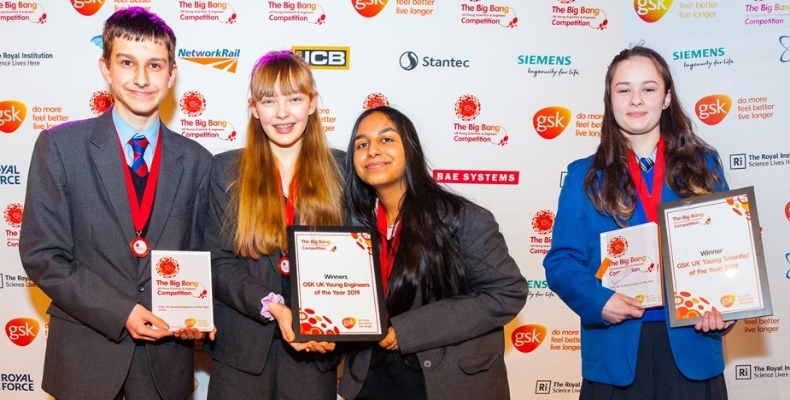 Fifteen-year-old Maeve Stillman from St Mary’s College in Derry received the Young Scientist of the Year award, and Young Engineer of the Year went to 14-year-olds Grace Lord, Brendan Miralles and Aalia Sellar from Loughborough Schools Foundation. Maeve presented a research project on improving our understanding of how activated charcoal affects the absorption of everyday medicines including paracetamol. The winners of the Young Engineer of the Year award, consisting of students from Loughborough High School and Loughborough Grammar School, presented an app – Music Splash – that uses machine learning to analyse music performance and provide feedback, in an effort to address the need for better access to music education. The judges have been blown away by the quality of entries from all the finalists. Emily Xu, 2018 GSK Young Scientist of the Year is now pursuing a degree in chemical engineering at ICL, and has spoken in Parliament during Tomorrow’s Engineers Week 2018 as an ambassador for young women in STEM. As part of their winning prizes, Maeve, Grace, Brendan and Aalia will all benefit from a range of mentoring and work experience opportunities, as well as VIP visits to top science centres with their families.